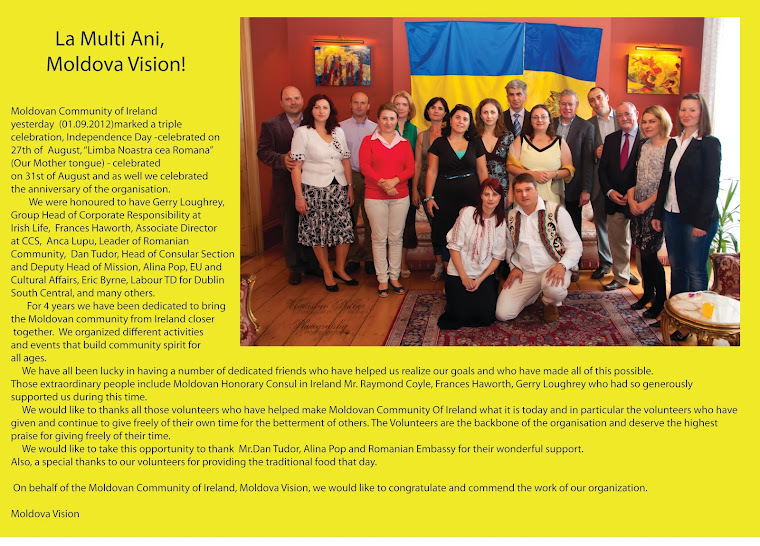 Comunitatea Basarabenilor din Irlanda “Moldova Vision” împreună cu comunitatea românilor din Irlanda, Romanian Community of Ireland, au creat o zi de poveste pentru copii, aducând la Dublin, prin intermediul Teatrului de Păpuși “Guguța” din Chișinău - reprezentat prin actorii Gabriela Lungu, Ana Stavilă, Viorica Vicol, Vasile Palea - piesa de teatru “Căprița ștrengăriță”. 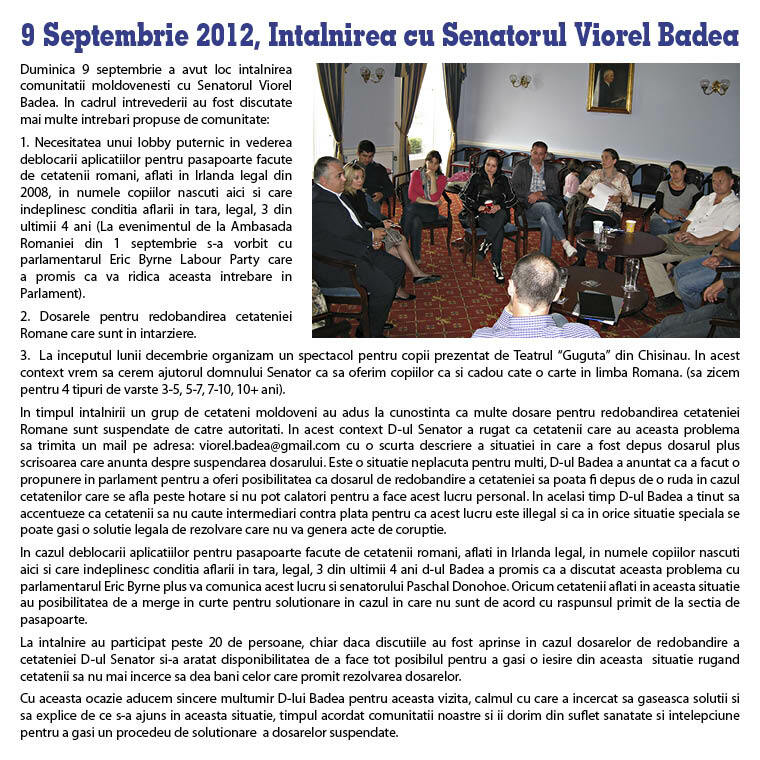 Acest eveniment este o continuare a tradiției începute de “Moldova Vision” care a organizat și în anii precedenți reprezentații pentru copii cu participarea actorilor de la Teatrul de Marionete și Teatrul “Licurici” din Chișinău. 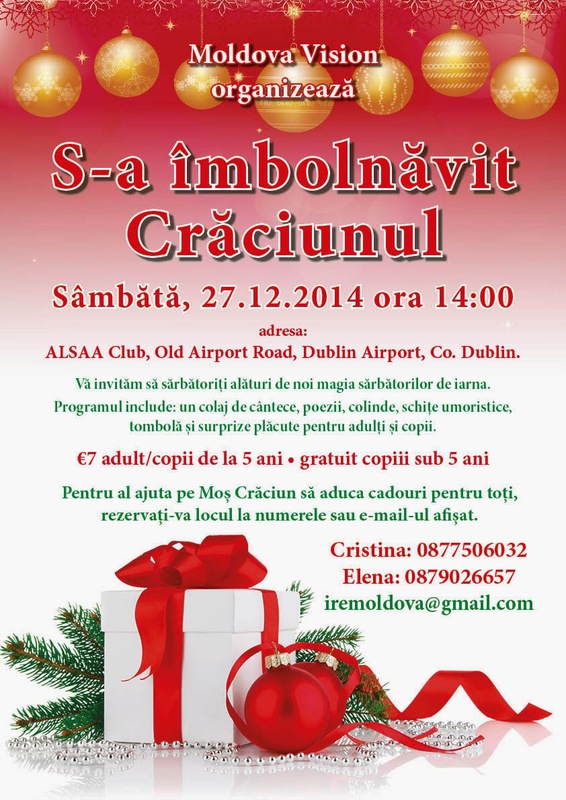 Evenimentul de anul acesta a oferit copiilor și părinților un spectacol minunat cu jocuri interactive, cântece și dans urmate de magie prezentată de The Children’s Magic Entertainer Dublin, magicianul care încântă mii de copii în parcul de distracții Tayto. 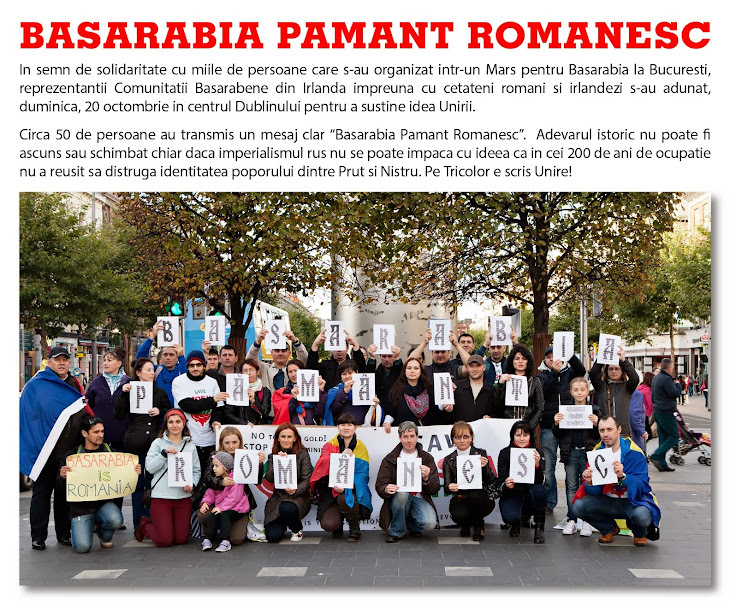 Trebuie amintit momentul de facepainting pentru care mulțumim Cristinei Strat din echipa RCI pentru răbdarea de care a dat dovadă să picteze cei peste 150 de copii prezenți precum și momentul în care copiii s-au delectat cu jocuri si concursuri alături de echipa teatrului de păpusi. 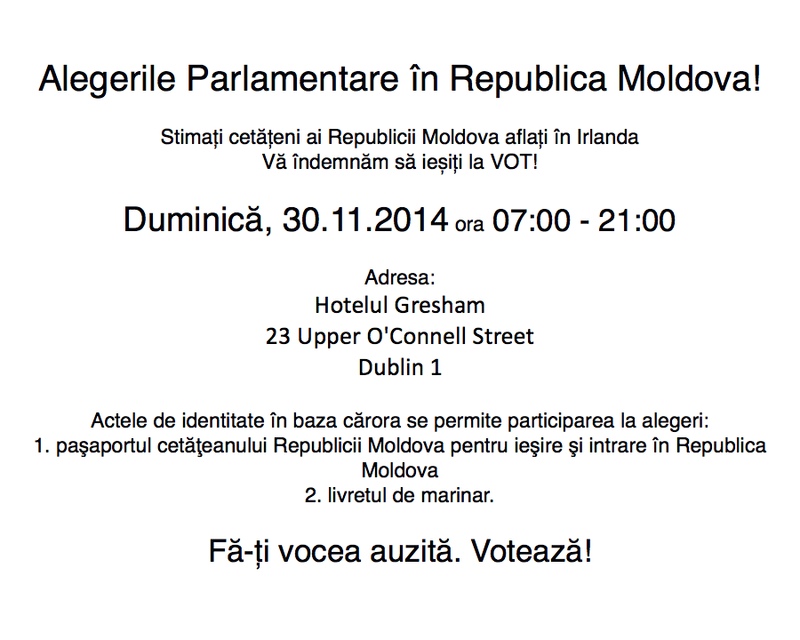 Mulțumim domnului Serghei Petrovschi, președintele Comunității Basarabene din Irlanda, domnului Florin Andreiu membru RCI, voluntarilor organizației Moldova Vision și echipei RCI pentru organizarea acestui eveniment dar și sponsorilor fără de care acest eveniment nu ar fi fost posibil: BLUE AIR (care continuă tradiția prin a ne oferi bilete tur-retur București-Dublin pentru actori), LCC MONEY TRANSFER, Irish Life, companiei Coca Cola și Largo Foods pentru sucurile și crispsurile oferite; Alimentara Napoca, Magazinele Moldova din Dublin pentru susținerea logistică. 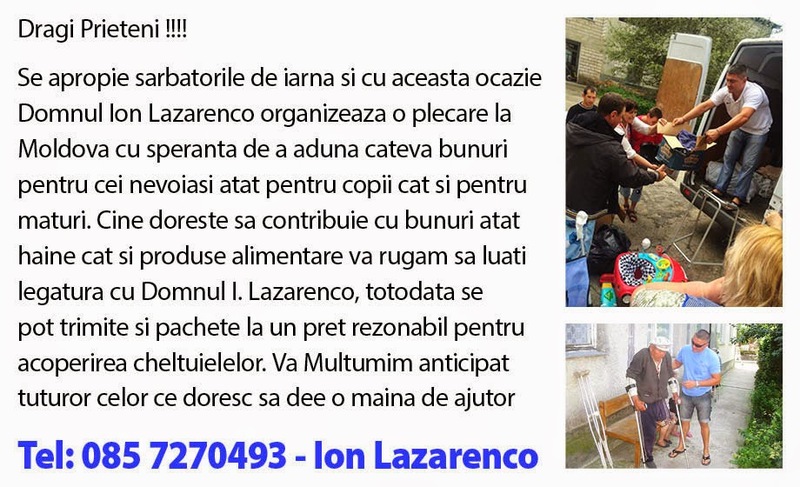 De asemenea mulțumim sponsorilor care au oferit premii pentru tombola organizată în cadrul spectacolului: Tayto Park, Motty’s Garage, Fantesia Cakes, Make-up by Cristina Strat și Biroul Relații Interetnice Chișinău pentru setul de cărți. 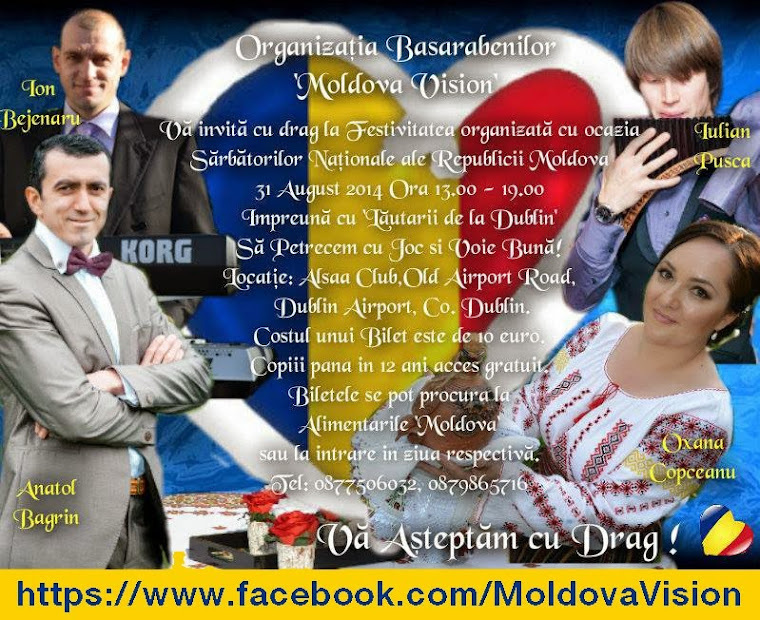 Pozele de la eveniment le găsiți pe www.moldova.ie grație fotografului Chriss Farrell sau pe pagina de facebook RCI de Chris Dancă. 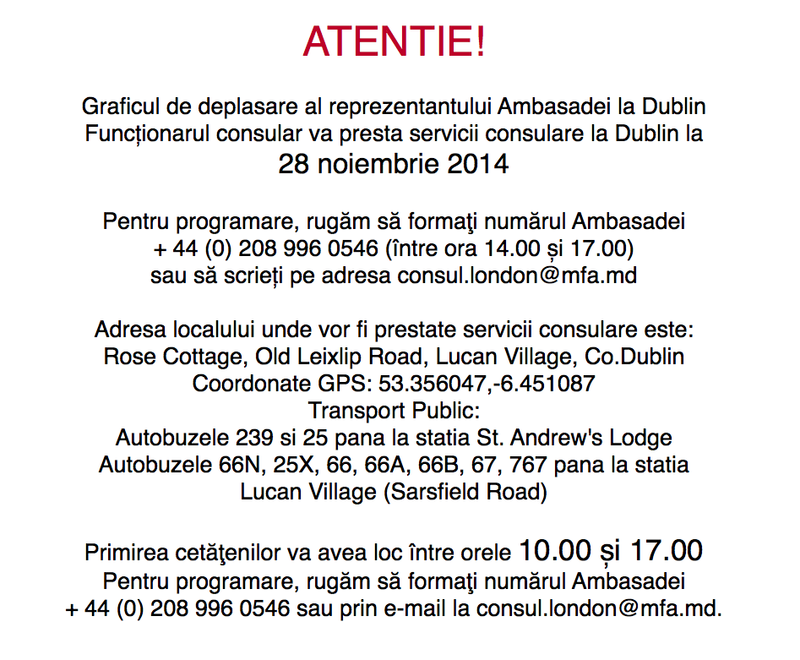 Mulțumim tuturor celor care au fost alături de noi și s-au bucurat de surprizele oferite! “Mr. Chairman, thank you for calling this hearing and for giving me the opportunity to speak. The topicality of its focus is obvious: All of us in preparing our remarks have had to consider the very real risk that developments on the ground are moving at such a rapid rate that anything we had been planning to say even a few hours ago may have been overtaken by events in the interim. And its importance cannot be overstated: what Moscow is up to in Moldova could easily prove more fateful to Europe and the West than did Russia’s invasion of Georgia six years ago and its ongoing aggression in Ukraine now. The three reasons that is the case can be quickly stated: First of all, the outcome of Vladimir Putin’s actions in Ukraine and thus of his entire imperial project will depend on what Moscow does in Moldova’s Transdniestria. 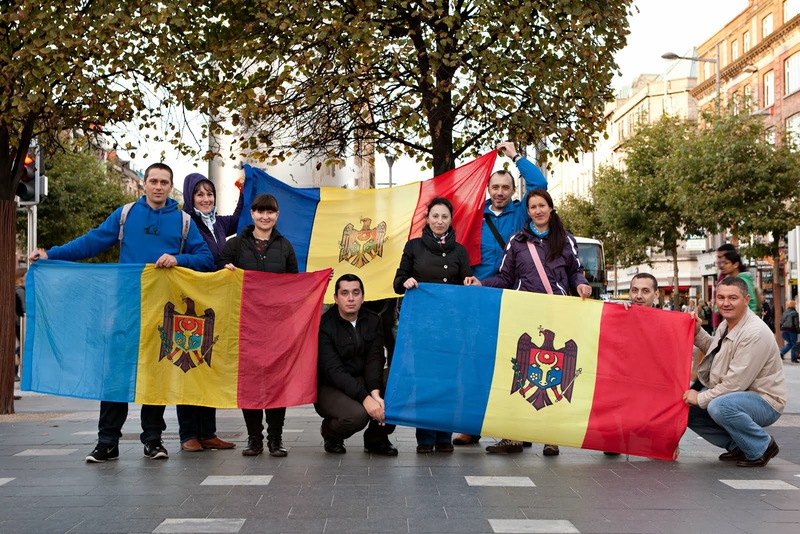 Second, in his efforts to derail Moldova’s efforts to join Europe, Putin has put in play the Gagauz, a Turkic community in the country’s southeast that would likely secede violently if Transdniestria exits with Russian help. And third, the demise of the Moldovan state which these two things would cause could trigger changes not only in the borders of southeastern Europe but also force the federalization of a greater Romanian state, reverse the post-World War I settlement there, and contribute to a radical destabilization of the continent. Each of these possibilities requires additional comment, and that will be the focus of my remarks. But because these dangers are so great and because there are ways that we can counter them, I would like to conclude by suggesting five steps the United States should take now to recognize Moldova’s importance and to prevent Putin from achieving his destabilizing goals there and elsewhere. We have enormous reserves of soft power, indeed, an overwhelming amount of it compared to Russia; and if we act expeditiously, we can prevent a situation from emerging in which we might be forced to use hard power, something that in this theater we are at a relative disadvantage. For two decades, Moscow has supported both actively and covertly the breakaway Transdniestria region, a place where many have observed that the August 1991 coup against Mikhail Gorbachev succeeded and one which has one of the largest Soviet arms caches which the regime has sold off to terrorists and others to support itself. The Putin regime has declared Transdniestria “a frozen conflict,” and many in the West have accepted the idea that there must be a negotiated settlement in which Moscow will have the whip hand. That acceptance, of course, has meant that no settlement is possible because the Russian government prefers managed instability to a stable, thriving and pro-Western Moldova. In recent weeks, Moscow propagandists have changed their thematics on Transnistria. They have proclaimed it “a second Crimea,” arguing that like Crimea, its population which Moscow untruthfully claims consists of a Russian majority, Transnistria wants to become part of the Russian Federation and that Moscow should agree. (For an example of this line of argument, see odnako.org/blogs/pridnestrove-vtoroy-krim-kak-eto-budet-i-kto-nachnyot-voynu-chtobi-etogo-ne-sluchilos/). But more disturbingly, Russian writers and officials have begun talking about Transnistria as an ally of Russia’s in Putin’s project of creating “Novorossiya,” a new Moscow client state stretching from Crimea in the east to Transnistria in the West and reducing Ukraine to a landlocked country or even eliminating it altogether via partition. There have already been credible reports that armed individuals and groups from Transnistria have entered southwestern Ukraine and Odessa in support of secessionist groups there. If Moscow does launch an overt invasion of Ukraine, in support of its current covert subversion of that country, it seems clear that Transnistria will play a major supporting role, at a minimum forcing Kyiv to divide its forces and at a maximum catching Ukraine in a two-front war. 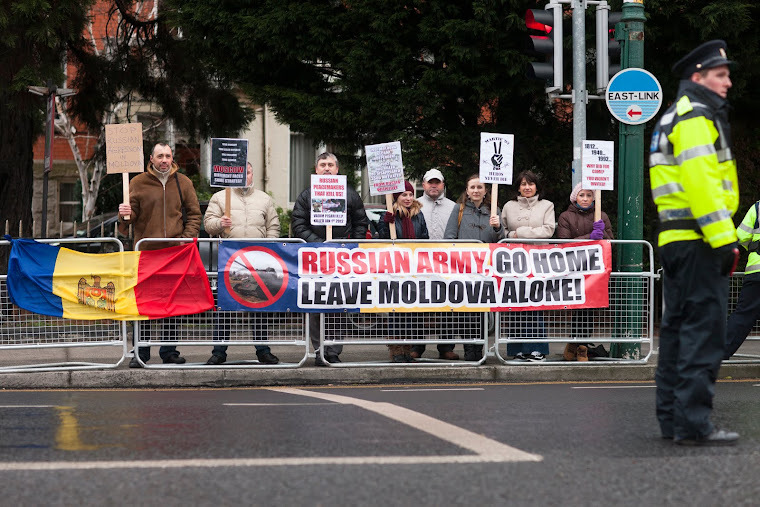 The second Russian action in Moldova, one that has attracted far less attention but that may ultimately play an equally large geopolitical role, is Moscow’s promotion of Gagauz separatism. The Gagauz, a 200,000-strong nation living in a dispersed area about 80 km southeast of Chisinau, have long wanted greater linguistic and political autonomy. In the early 1990s, their activism forced the Moldovan government to cede more power to them and to agree, should Moldova’s external borders be changed by the exit of Transnistria, to the right of the Gagauz to move toward independence. 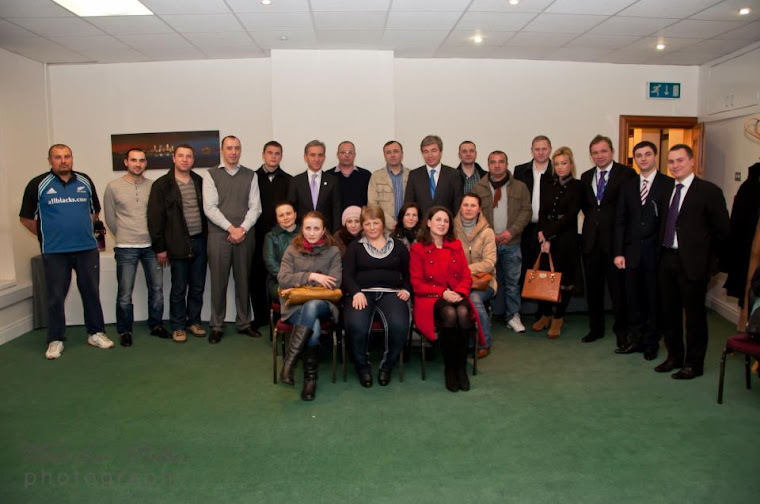 The Gagauz have neither the numbers, nor the arms supply, nor the international contacts that the regime in Transnistria does, but they do have one important political resource in addition to the support they are getting from Moscow: they are Christian Turks and thus enjoy the attention and potential support of both the Moscow Patriarchate and the Republic of Turkey. In the event of a crisis, either or both could come to their aid, something the Russian government undoubtedly would use as a cover to promote a new wave of secessionism. If both Transnistria and a Gagauzia defined in the broadest terms were to secede, Moldova would be left a rump state where a large percentage of the population would likely press for union with Romania. What would happen if a Moscow-provoked disintegration of Moldova led to its union with Romania? Almost certainly, given the differences in historical experience arising from Soviet control, that new state would be federalized. Federalization in turn would spark demands for a Hungarian autonomy in the north, and such demands, given the Hungarian government in place, would likely enjoy the support of Budapest. That could lead to the kind of controversy that the post-1918 settlements were designed to prevent and thus to destabilization in an even larger part of the European continent. • First, we need to recognize Moldova’s centrality to our security concerns and to build up expertise. For too long, the US has treated Moldova as, in the words of some officials, “an orphan country,” because few Americans have developed expertise on this region and because many Moldovans in the West act so closely with the Romanians that people do not see the difference. • Second, we need to expand Western broadcasts to Moldova and especially Russian-language broadcasts. Too many people in Transnistria and Gagauzia turn to Moscow television for news and information. What they get of course is Russian propaganda. It is time for us to create a Russian-language channel for Russian speakers who are citizens of Russia’s neighbors and not potential citizens of some mythical Russian Empire. • Third, we need to promote change within Moldova not by holding it up to standards that will allow us to say no to aid but by means of educational and professional exchanges that will send Americans to Moldova and bring Moldovans to the US. Such exchanges were the heart and soul of the Marshal Plan and played a key role in creating the Europe we see today. • Fourth, we need to recognize that our approach to Transnistria has been wrong. Cooperating with Russia when Moscow is really prepared to cooperate on the basis of common interests is one thing. Cooperating with Russia when Moscow is totally uninterested in cooperation and does not recognize any common interests is something else. The Transnistria problem should be solved by direct talks between its leaders and Chisinau on the basis of the same principles we have proclaimed elsewhere: the inviolability of state borders and the protection of the rights of ethnic minorities as the most effective way of allowing for national self-determination. • And fifth, we need to offer a united Moldova immediate membership in NATO and together with our European allies put it on a fast track to European Union membership as well. Despite the vocabulary of many in Washington over the last two decades, one does not “qualify” for a defense alliance: countries are included because they are threatened and because their membership will help the alliance do its job. Moldova qualifies on both grounds. Începând de astăzi şi până pe 4 martie, se vor desfăşura Zilele Creangă, ediţia a IV-a, organizată în duplex, la Iaşi şi Chişinău. 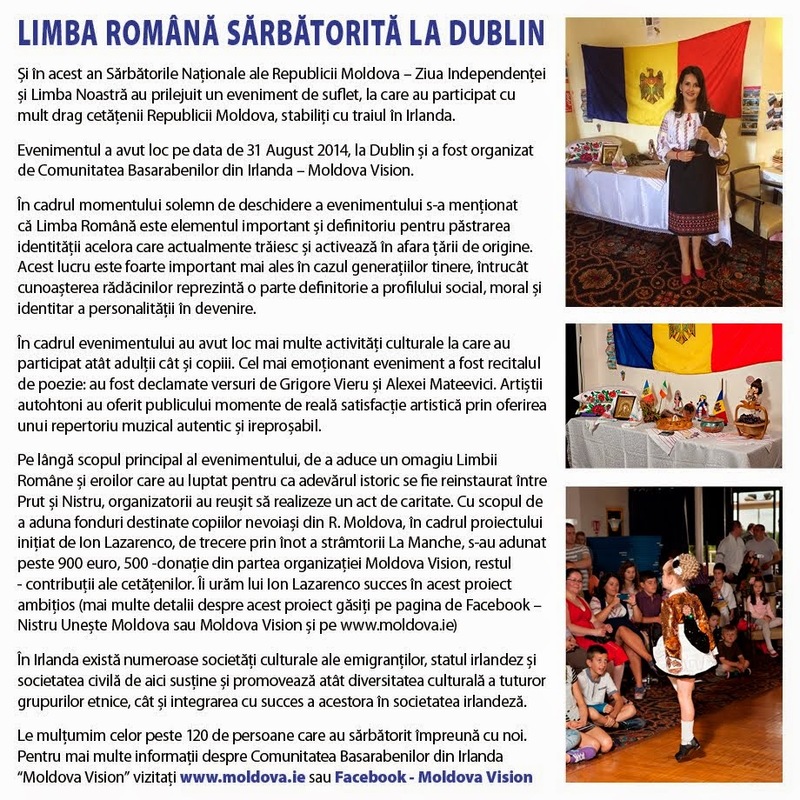 Potrivit programului, pe 1-2 martie, la Iaşi va avea loc un spectacol al elevilor şi un recital al actorului Petru Cibotaru, precum şi o întâlnire cu scriitori şi oameni din cultură din Republica Moldova, la Muzeul „Bojdeuca lui Ion Creangă” din Ţicău, Iaşi. De asemenea, la Iaşi va avea loc o vizită de documentare cu genericul: „Pe urmele diaconului Ion Creangă”, la Biserica „Sfinţii 40 de Mucenici” şi Mănăstirea Golia. 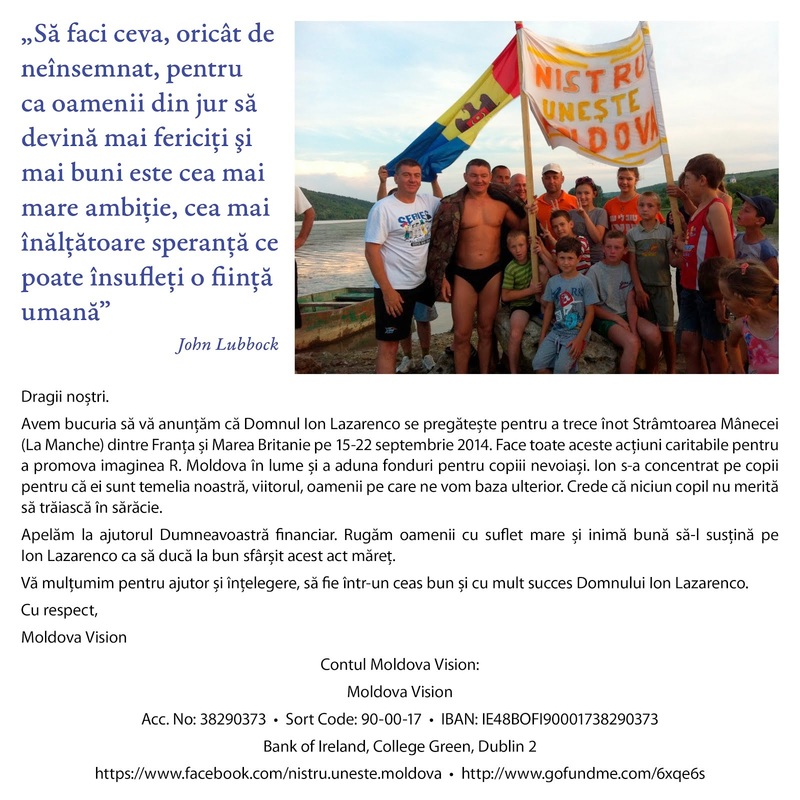 O masa rotundă cu tema: „Continuitate şi discontinuitate în literatura pentru copii” va avea loc la Universitatea „Petre Andrei”. Doritorii vor putea viziona spectacolul „Dănilă Prepeleac” şi festivitatea de decernare a Premiilor „Ion Creangă”, la Teatrul pentru Copii şi Tineret „Luceafărul”. La Chişinău evenimentele se vor desfăşura în zilele de 3-4 martie. Luni, la rondul din spatele statuii lui Ştefan cel Mare şi Sfânt, va fi vernisată expoziţia „Ion Creangă şi lumea personajelor sale”, organizată de Institutul Cultural Român „Mihai Eminescu” la Chişinău. La Filiala de Carte Românească a Bibliotecii Naţionale pentru Copii „Ion Creangă” (în incinta Teatrului „Licurici”) va avea loc Spectacolul-colocviu „Ion Creangă pe unde nemuririi”, la care vor participa scriitori şi alţi oameni de cultură din România şi Republica Moldova. Aici vor mai fi prezenţi copiii premianţi în Concursul povestitorilor „Stau câteodată şi-mi aduc aminte…”, grupuri teatrale de la liceele „Natalia Dadiani” şi „Alexandru Ioan Cuza”. 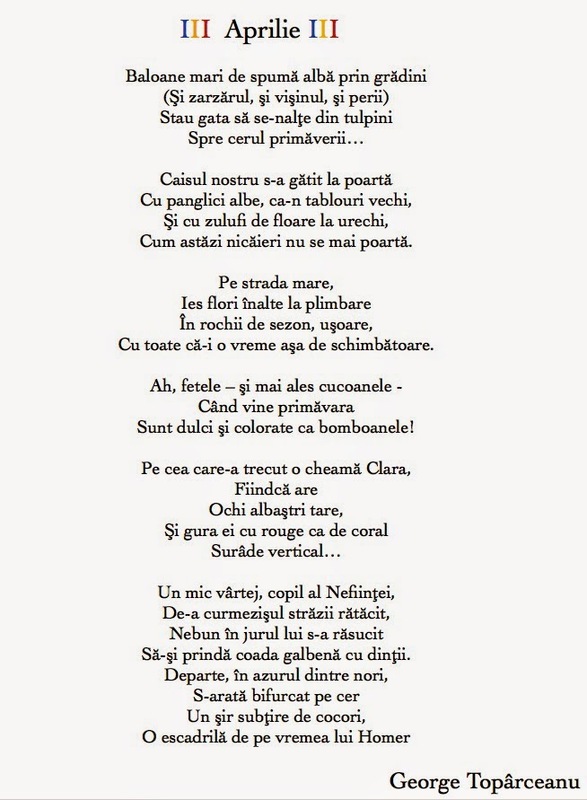 În spaţiul bibliotecii va fi vernisată expoziţia de carte „De la Creangă moştenire”, care va avea şi o variantă virtuală pe web. În aceeaşi zi, la Institutul de Filologie al Academiei de Ştiinţe a Moldovei se va desfăşura Colocviul ştiinţific „Originalitatea lui Ion Creangă şi locul său printre povestitorii europeni”. În 4 martie, în incinta Teatrului „Licurici”, va avea loc Concursul de inteligenţă şi creativitate „Miss Smărăndiţa – 2014”, ediţia a XIII-a, la care vor participa 15 elevi din diverse şcoli şi licee din mun. Chişinău şi suburbii. Programul va continua cu Medalionul literar „Creangă – un basm fără sfârşit” la Universitatea Pedagogică de Stat „Ion Creangă”. Zilele Creangă sunt organizare de Ministerul Culturii al Republicii Moldova, Biblioteca Naţională pentru Copii „Ion Creangă”, Muzeul „Bojdeuca lui Ion Creangă” din Iaşi şi alte instituţii. Zilele Creangă vor continua la Biblioteca Naţională pentru Copii „Ion Creangă” până la 7 martie, cu expoziţii, concursuri, spectacole teatralizate şi alte activităţi.